An unmanned Russian Progress 47 cargo craft approaches the International Space Station on July 28, 2012 to test an upgraded docking system. A robotic Russian cargo ship made its final departure from the International Space Station yesterday (July 30), after spending several months attached to the orbiting outpost. 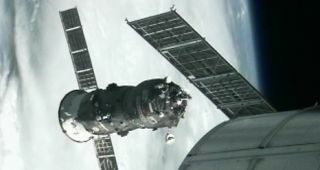 The unmanned Russian Progress 47 cargo ship undocked from the space station on Monday at 5:19 p.m. EDT (2119 GMT), as both spacecraft flew over Kazakhstan, according to NASA officials. After backing a safe distance away from the complex, the cargo freighter will conduct several weeks of unrelated engineering tests, before it is deliberately sent to burn up in Earth's atmosphere over the Pacific Ocean. Russia's disposable Progress vehicles are used to ferry clothing, food and other supplies to the International Space Station. The cargo ships remain parked at the outpost for several months, and after the astronauts aboard the station unpack the cargo, the spacecraft are typically filled with trash and other unwanted items. Before leaving the space station, the Progress 47 spacecraft conducted a test of an upgraded docking system that Russia intends to use on future unmanned Progress and manned Soyuz vehicles. The Progress 47 successfully completed the docking test on its second try, after a first attempt on July 23 was prematurely aborted due to a technical glitch. To conduct the test, the Progress 47 initially undocked from the space station on July 22. The cargo ship was expected to automatically park itself at the Pirs docking compartment on the Russian segment of the space station the following day, but the attempt failed and the maneuver was aborted. Russian engineers traced the glitch to lower-than-expected temperatures on the docking system. After adjustments were made, the spacecraft successfully re-docked to the space station on Saturday (July 28). The successful test of the Kurs-NA docking system was a demonstration of an updated version of the Kurs system that has been integrated into Russian spacecraft for years. Several upgrades were made to the newer version, including better electronics that are expected to use less power and improve safety. The Progress 47 arrived at the space station in April to deliver clothing, food and other supplies to the astronauts living aboard the space lab. The next Russian cargo ship, Progress 48, is slated to launch to the space station on Wednesday (Aug. 1) from the Baikonur Cosmodrome in Kazakhstan.